Barbara Brenner was my partner for 38 years. For 15 of those years I shared her with Breast Cancer Action: Barbara was the organization’s executive director from 1995 to 2010. Under her leadership, BCAction grew into a national powerhouse to be reckoned with, taking on the cancer industry like no other. Barbara defined BCAction’s persona and voice: fearless, smart, fierce, unapologetic, and, at the same time, compassionate. If you knew Barbara, you know exactly what I mean. 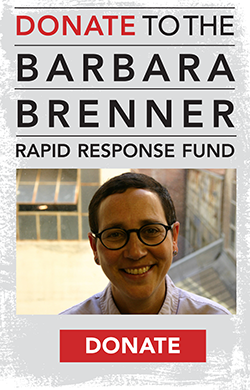 One of the ways BCAction carries on Barbara’s fearless legacy is the ability to quickly address emerging critical issues in breast cancer thanks to the Barbara Brenner Rapid Response Fund. This special fund honors Barbara’s work to create an organization able to respond at a moment’s notice to breaking news about breast cancer, guaranteed always to carry the voices of women living with and at risk of the disease. It’s been five years since Barbara retired, but her voice and vision continue to influence the feisty organization she led for 15 years. Barbara died in 2013 and my world hasn’t been quite the same without her. Barbara’s Fund is just one way I honor her legacy, and help ensure BCAction has the resources they need to respond nimbly to critical issues in breast cancer. I hope you’ll join me by making a donation to Barbara’s Fund today.